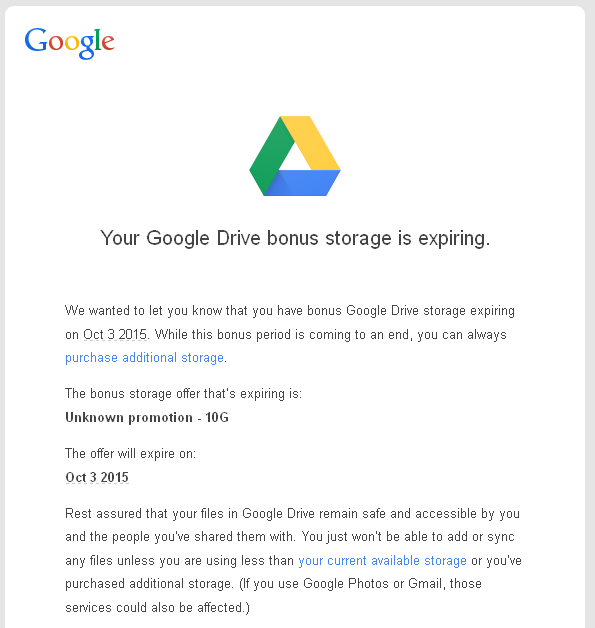 We wanted to let you know that you have bonus Google Drive storage expiring on Oct 3 2015. 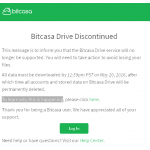 While this bonus period is coming to an end, you can always purchase additional storage. 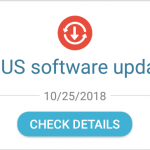 This promotion that Google forgot what it was was probably 10 BG bonus space for installing QuickOffice app to my Android phone and linking it with my account. 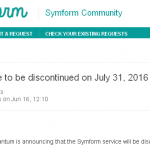 In these two years a lot of things has happened, including Google discontinuing QuickOffice last year. Note that the Google logo in the e-mail is still the old one, even if the company changed the logo just two days ago. What to do if you are using those 10 GB of free space? If you are, the data won’t get deleted, but you won’t be able to use more data until you either upgrade to a paid plan or delete some data to free up enough space.